As per usual, we're still plugging away on the bathroom these days. That's not really true. We're actually spending more time not working on it at all. But that's life, I suppose. I'm still waiting for the fabric that I ordered for the new kitchen chairs to arrive, but those will get done eventually, too. So in the mean time, while we're procrastinating and waiting, I'm going to jump into la la land and "build" my dream bathroom. What it would look like if it didn't have to double as a laundry room. And if we didn't have a giant turtle tank. And if I got to make every single decision and had a significant other who didn't care. 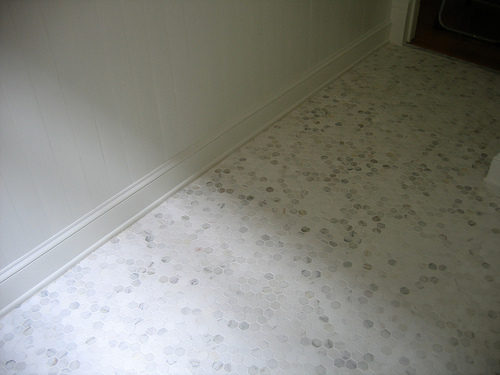 And if we could afford marble hex tile floors. Sigh. Speaking of floors, lets start there. This modern version of marble hex tile is pretty nice. Marble Hex Tile from Door Sixteen. But deep down in my soul I long for plain ol' black and white. 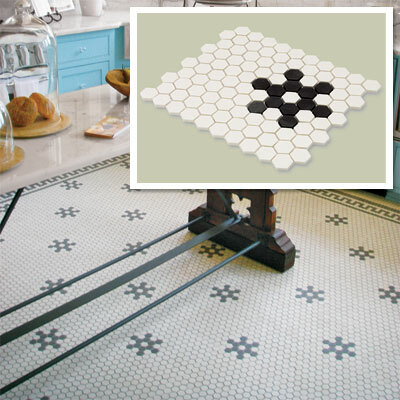 Hex Mosaic Floor Tile from This Old House. *Yes, I know that's a kitchen and not a bathroom. For the longest time, I wanted a clawfoot tub. My mom and dad put one into the 1950's era house that I grew up in, and it was big and unique and lovely. 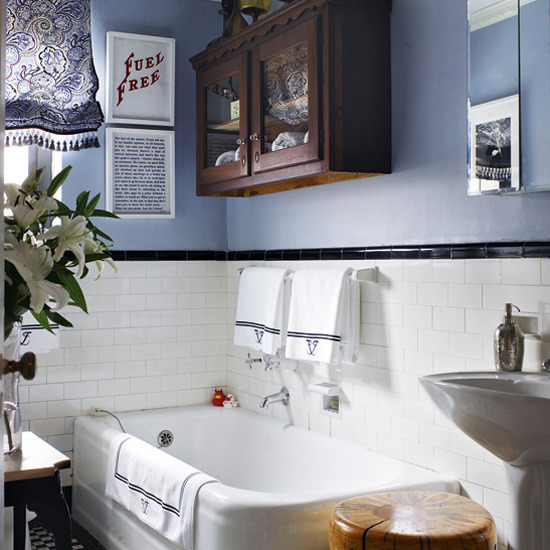 But, lately I've been pining after one of these corner tub guys. 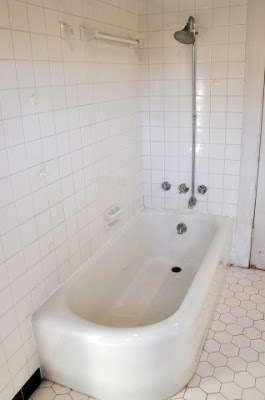 1920s Rounded Corner Tub by Home Klondike. They're quirky and I love it. I've never seen a reproduction, so I imagine I'd have a time and a half trying to find one. Good thing I'm not getting one. The next thing on my dream list is something that I'm actually getting - subway tile! We're laying it in the traditional pattern shown in the picture above, but I would love to do a full wall in a herringbone pattern. 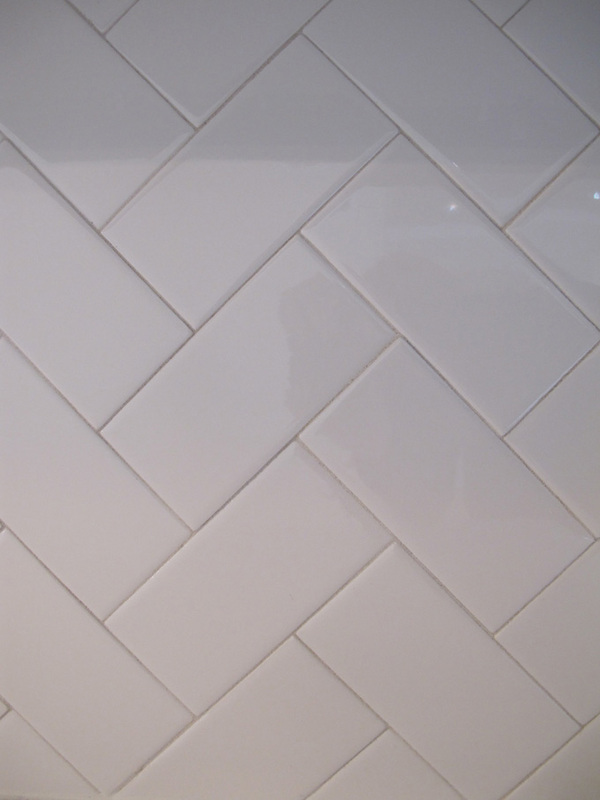 Subway Tile in Herringbone Pattern by Love, Sweat, and Tears. Where the subway tile ends, let the beadboard begin! 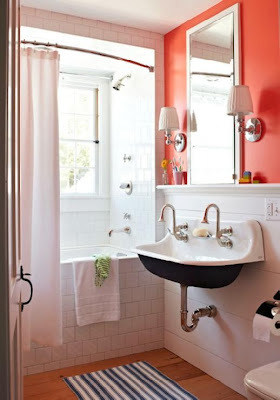 Bright DIY Bathroom Reno via Better Homes and Gardens. Floor to ceiling might be a little bit too cottage-y for me. But this? It's perfect. I'll take that cast iron Kohler utility sink, too. 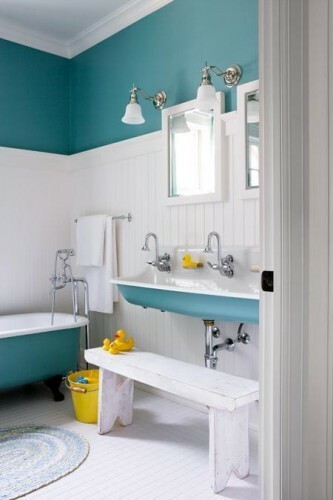 And that bright paint colour above the crisp white beadboard? Heck yes. How about orange? Orange Bathroom via Decor Pad. Oh look, there's that sink again. Which happens to cost an obscene amount of money. In place of the stacking laundry pair, we'd have a shower stall. A neat one. Clawfoot Shower Pan via Houzz. I may not get my sink or hex tile or fancy shower stall. 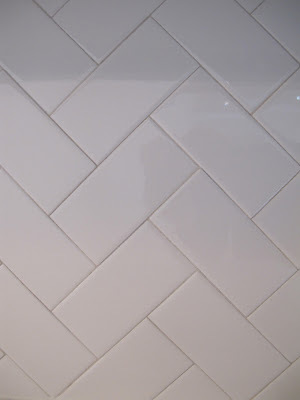 And my subway tile may be traditional instead of herringbone. But we can always add beadboard later (like in a few years when Mike's focus has shifted to other areas of the house and he's no longer adamantly opposed to beadboard in the bathroom). 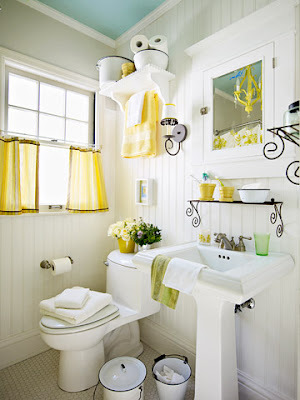 And paint and shower curtains and towels and window treatments are flexible. They can change. And who knows - maybe I can put some hex tile somewhere else, where there's a smaller area to be covered? A kitchen back splash, perhaps? And we do have original bead board in the kitchen, so maybe I just need to appreciate that some more. It's time to get back to reality. Even without a million dollars, our bathroom will be lovely. Laundry and turtle tank and all.